1. Does it matter who files first? There is no legal significance to who files first. Sometimes a party will file because the other party just isn’t taking them seriously. I call it the “dammit this time I mean it” approach. I have not verified this but my sense is that women are more often the petitioner. Not because they are more apt to ask for the divorce but they find that their husband has emotionally and/or physically left the marriage but not taken any legal action. Sometimes a couple really wants to be cooperative and will choose to file together. This can either be by “joinder” or a legal fiction my colleagues and I have developed called a “co-petition”. This seems far less adversarial than Petitioner and Respondent. 2. Do we have to have all the details worked out before we file? No. In fact, the divorce petition should not provide any details about your financial status. We generally state “to be determined” or “reserved” on financial issues. Remember, everything filed with the court is public record and can be seen by anyone. Most couples will file a petition to get the clock running. 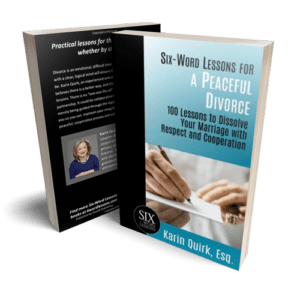 (There is a 90 day waiting period in Washington State before a divorce can be final) We then use the interim time to work out the details on property and parenting. 3. Are there reasons to wait to file? Sometimes a couple wants to purchase a home or refinance an existing mortgage. In this case, we often delay filing a petition until the loan is closed. It is possible to obtain financing while the divorce is pending, however. A lender will want to see what each person’s obligations, income, and assets will be. An executed Property Settlement Agreement can fulfill this requirement. 4. What if I don’t know where my spouse is? This can be challenging but can be done. Sometimes you will need to have a process server do a search or in some cases, you can serve your spouse by mail or by publications. There are special rules that must be complied with. Out of country becomes even more challenging. If you know your spouse will not respond or cooperate then you want to make sure your petition spells out everything you want. (unlike the more cooperative approach described above) If you are expecting a “default” judgment, you can only receive what you asked for in your original papers. You really want to do this with the help of a lawyer because you do not want your spouse coming back in the future to set aside your judgment. 5. What is the very first step? Not surprisingly, your first step is to talk to a lawyer. Pay for a consultation, not a free “sales pitch”. Get some good advice on how to start your case. You will feel much more confident if you have a plan. Of course, we are always here to help you through this process.